An alternative to traditional design, the Trtl “pillow” offers a new type of neck support which outshines the usual overstuffed travel pillows. Measurements reflect the pillow wrapped flat for transit, not in-use. The Trtl is designed in the United Kingdom and manufactured in China. 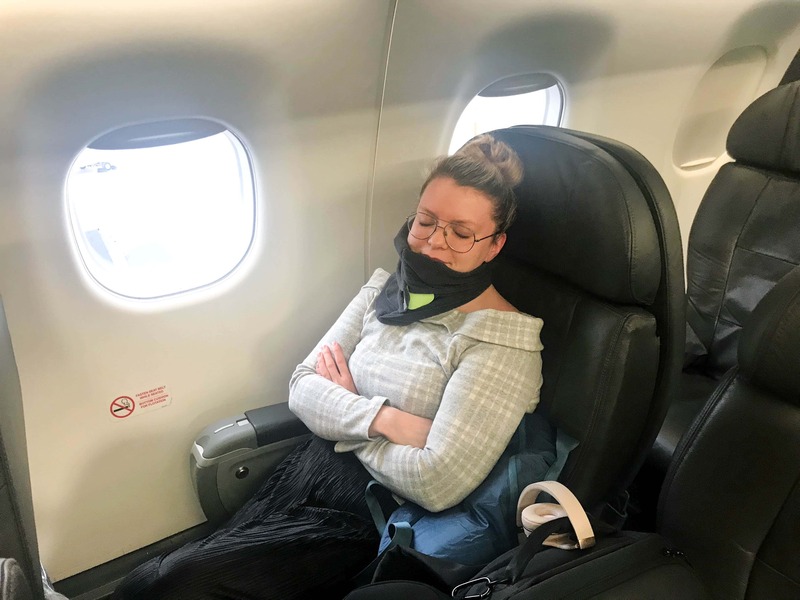 Whether you’re a business traveler, red-eye-regular, or transcontinental conqueror, chances are you’ve fallen asleep on a plane, train, car, or bus and encountered a crick in your neck as a result. When you’ve spent hours in transport, the last thing you need is to arrive at your destination in pain. While any jaunt through an airport convenience store will offer a plethora of neck pillows, variety is low, prices are high and you might not be sure what to look for in a product. We’ve done the leg work for you by testing out the Trtl Travel Pillow, a unique alternative to the traditional travel pillow. One common complaint with the traditional style of travel pillow is that it has a tendency to push your neck or head forward from the seat a bit too much. Depending on your body structure, this might not be a huge deal. If it is a big deal and you need an alternative, you may want to consider the Trtl. 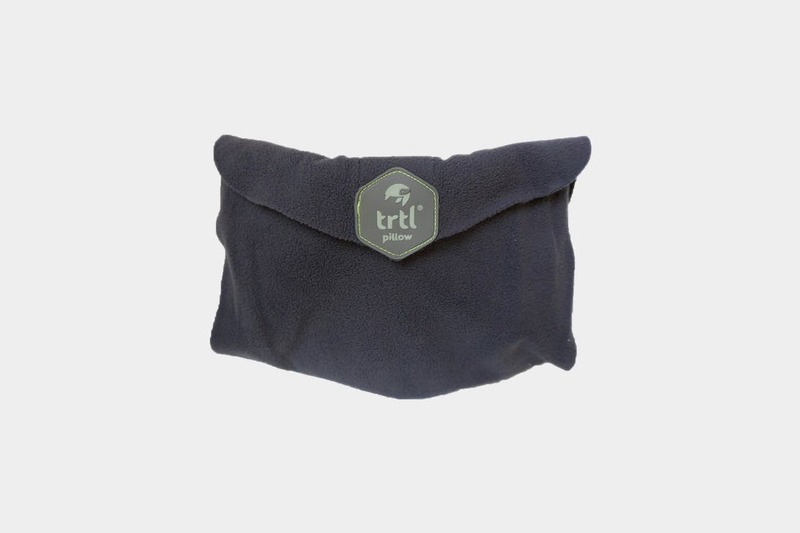 The Trtl pillow is composed of a fleece, scarf-like wrap which is secured with a Velcro strip. 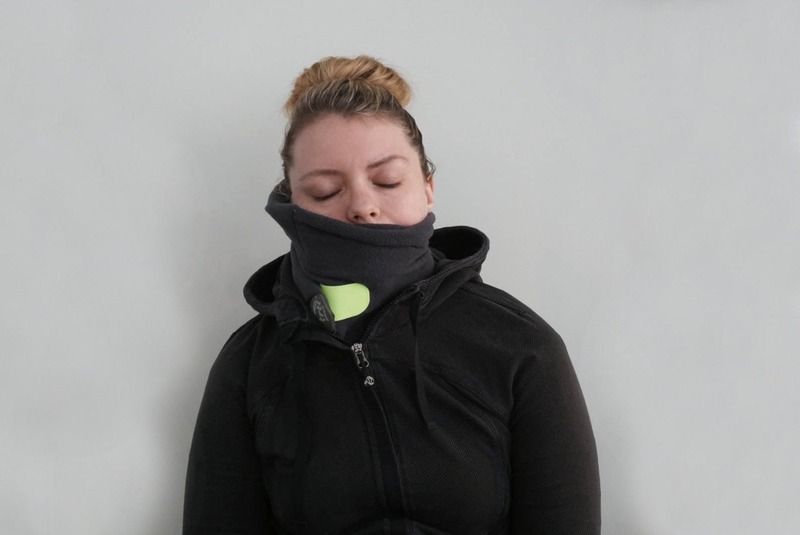 You wrap it around your neck and an enclosed plastic brace provides neck support, holding your head and chin in place while you doze off. The fabric is relatively thin, so it doesn’t add bulk behind your head—allowing you to rest comfortably against the seat headrest. If you’re a head bobber, get ready for a new life of supported, uninterrupted sleep! The fleece fabric is light enough to be breathable, while still offering enough density to avoid stretching out and losing that supportive nature. 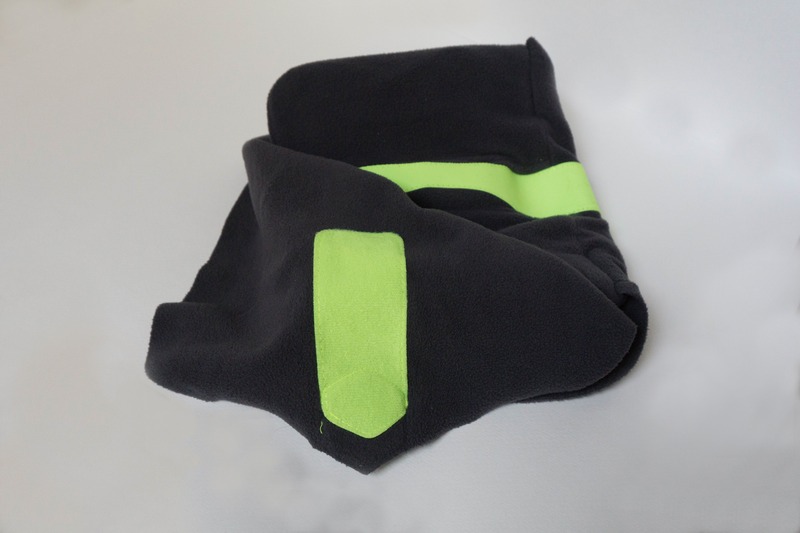 Fleece is notoriously soft and provides a comfy, cozy feel as it buffers your head and neck from the interior brace. The fabric on the pillow is seriously soft and relatively lightweight considering the support it offers. Think of a light, fall style sweater, in neck-pillow form! What’s not to like? The brace itself is composed of a firm plastic, flexible enough to provide some “give.” You can easily flatten it inside of your bag (approximately 50% more flat than in standard form), before you have to worry about it snapping. 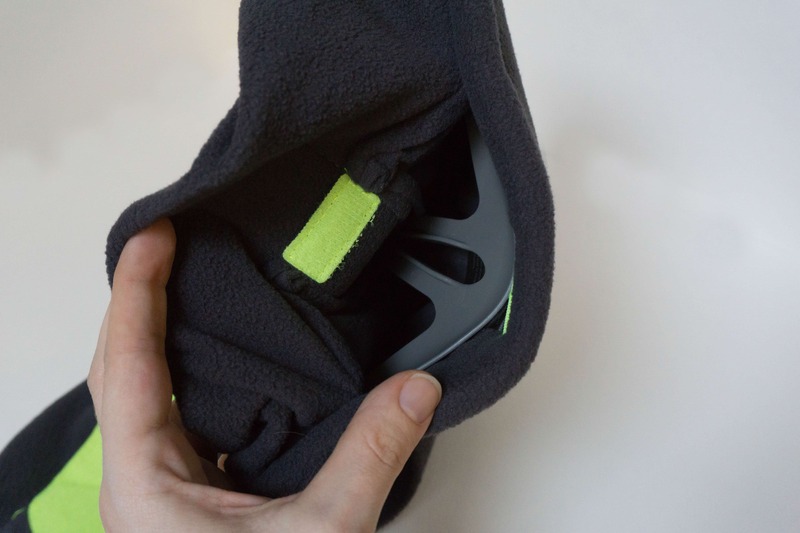 The pillow is secured in place by a strip of velcro which has a long connection point, allowing you to adjust the fit for whatever position you’d like. Conveniently, you can remove the brace from the fabric when you need to give the fleece a wash.
Getting used to this style of pillow certainly takes some patience, along with a bit of trial and error. It took quite a bit of fidgeting and three flights to find the perfect position to use this sucker. The best method we found was to, first of all, position the brace on the side of your neck. You can opt for putting it right in front, so your chin sits on it—but we found this to be a little unnatural. It puts quite a bit of pressure on your jaw which is just a weird feeling to get used to. Tightening the velcro will give you more support, but it’s kind of a double-edged sword. You know that feeling when you put a Band-aid on too tight around your finger? Yeah, it’s a similar feeling around your neck. Not comfy. When it is too tight, it can cause pressure on your jaw. You should be able to find a happy medium here that will give you enough support without strangling you, it might just take a few attempts. We did also find that this pillow works really well with a hoodie, if you’ve got one handy. You can kind of situate the base of the pillow inside the collar, which helps it stay upright. Plus, hoodies are clearly one of the most comfortable options for sleeping on a plane, so it’s a win-win. No matter how you slice it, getting used to this and finding your perfect setup can be a bit frustrating. To make matters worse, throwing headphones into the mix can complicate things. When paired with your run of the mill Apple wired headphones, the plastic brace of the pillow has a tendency to disrupt the base of the ear bud. This should only be a problem on one ear (whatever side the brace is on), but is nevertheless annoying. Over-ear headphones aren’t a solution either, as the brace gets in the way of one side—so you’re back to one ear listening. If you’re looking for sleep, this works great (an earplug in the other ear can help light sleepers) but if you’d like to nod off to a nice movie you’ll have to settle for audio in one ear. The pillow itself is much lighter and more compact than any other pillow we’ve seen, with the exception of inflatable travel pillows. We don’t really like having to blow up pillows, but hey, if getting red-faced and out of breath in the terminal is your thing, more power to you. We found that the Trtl tucked nicely into the Fjallraven Kanken Mini—even with books, art supplies, a camera and a wallet crammed in there—which says something about the size of this thing. While we do like the overall design and function of this pillow, we would have loved to see a small attachment to hook a carabiner to the pillow. Strapping it to the exterior of a travel backpack would be convenient. Without an attachment it either has to go inside a bag or in your hands. We like to keep our hands free (hence the backpack obsession). We think you’ll agree that comfortable sleep is the happiest sleep. Nothing but Zzzzs and smiles here! Good quality. Strong support from the brace. Fabric has held up, no wear. Brace is still supportive. Some maintenance required to keep velcro clean. Less bulk at the back of the neck. Lots of practice is required for the perfect position. Less-than-optimal positioning can cause jaw compression/ache. If a traditional travel pillow just isn’t for you, the Trtl travel pillow is a great alternative. It offers solid support with comfortable fabric that allows for a cozy sleep on your flight, bus, or train ride (or any situation where you need to sleep sitting down). The size makes it convenient for packing, which we love. One complaint is that it can be difficult to find your fit—if you aren’t a frequent flyer, you might get discouraged with the amount of time it takes to get it just right. Headphone use was also a miss for us, which is a major con. If you can get past these couple downsides, the Trtl offers a great night’s sleep and improves quite a bit on the traditional travel pillow design.